Takes 180 Minutes Minutes , serves 11 pounds. Remove extra turkey parts (neck, heart, kidney, liver) and reserve. Rinse turkey inside and out and pat dry using paper towels. Carefully slide your hands between the skin and meat loosening the skin around the shoulders, breast, thighs and drumsticks. 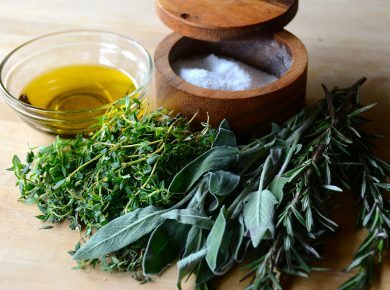 Fine-chop herbs and mix with olive oil. Rub the herb mixture between the skin and the meat, trying to disperse the herbs as evenly as possible. Pat the skin back into place. Rub the kosher salt inside the cavity and on the skin. Tie the legs together or tuck them under the flap of skin at the opening of the cavity. Tuck the wings behind the back. Transfer the turkey into a large plastic bag and tie super tight! Place this into a second bag and tie tight again. Refrigerate the turkey and turn it each time you open your fridge over the next THREE days. The night before you roast, remove the turkey from the bags and discard them along with any juices collected in them. 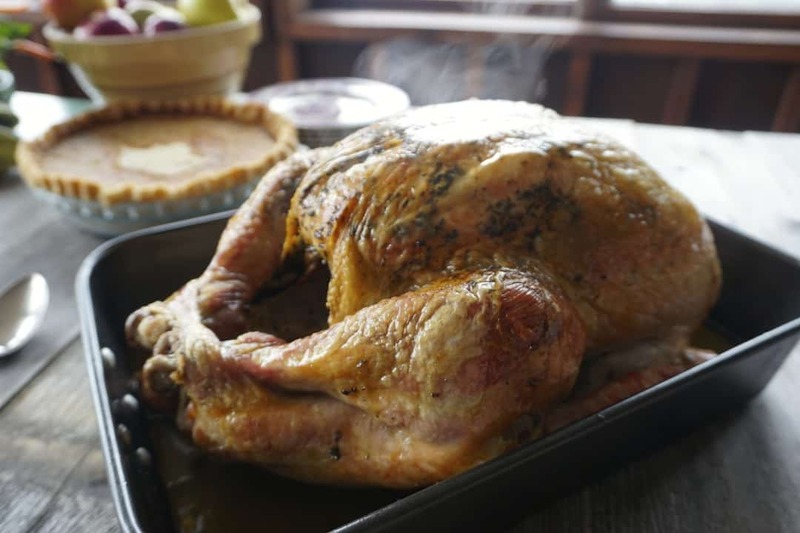 Pat the turkey dry with paper towels and place into a roasting pan. Transfer the prepared turkey into the refrigerator UNWRAPPED overnight. Place oven rack in the bottom-third position and preheat oven to 425°F. Remove turkey from refrigerator one hour before roasting. If making a dressing, prepare now and transfer it into a poultry bag, then into the cavity of the bird right before cooking. Place prepared turkey into oven and roast for 30 minutes. Reduce heat to 375°F and continue roasting for an additional 2 hours, basting every 20-30 minutes or so. Turkey is done when an instant-read thermometer in the thickest part of the thigh reads 180°F, or if a drumstick gives easily when pulled. Remove turkey from oven, cover with tinfoil and allow the juices to settle for 30 minutes before carving. This DRY-BRINED TURKEY recipe is astounding. Who knew that preparing a tender, moist and flavourful turkey could be THIS easy? 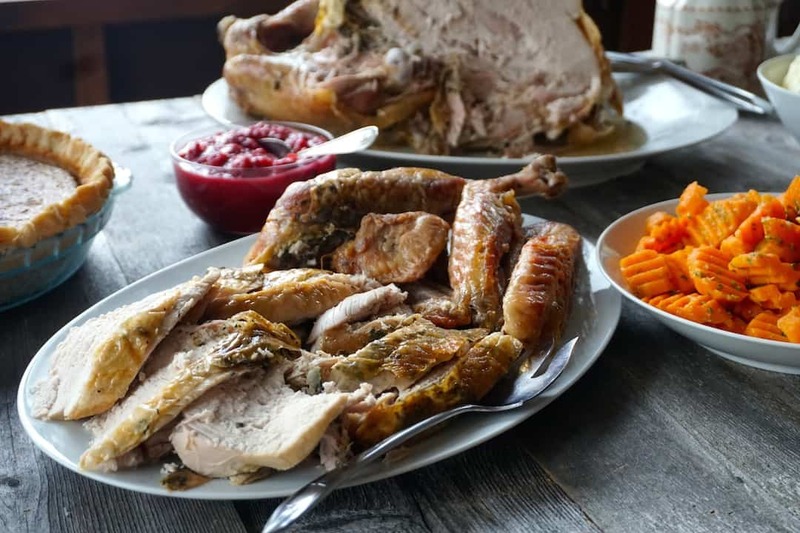 Any at-home chef will agree that preparing a memorable roast turkey dinner can be nerve-wracking, and if your road to making the perfect turkey has been like mine, you’ve tried pretty much everything. 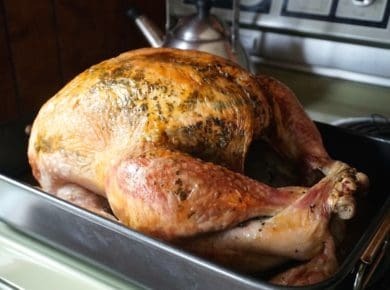 Some folks swear the bird needs to be roasted under a layer of bacon, while others try to plump up the flavour by soaking their turkey in salted water. I will admit, I almost tried the deep-fry in hot oil one year but “chickened out” – I value our cedar deck (and the overall structure of our cottage) a bit too much! 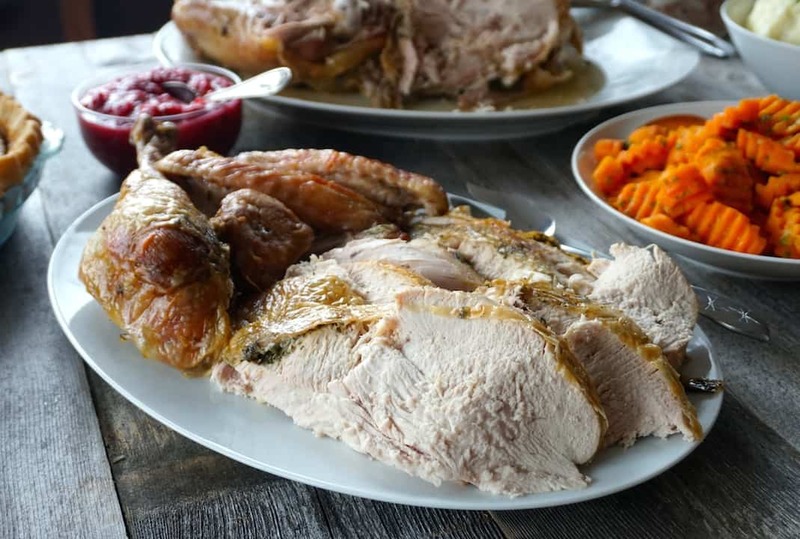 Thankfully, I stumbled across this DRY-BRINED TURKEY RECIPE and everything changed; gone are the worries about tenderness, flavour, texture and doneness. This recipe yields a perfectly cooked turkey each and every time. 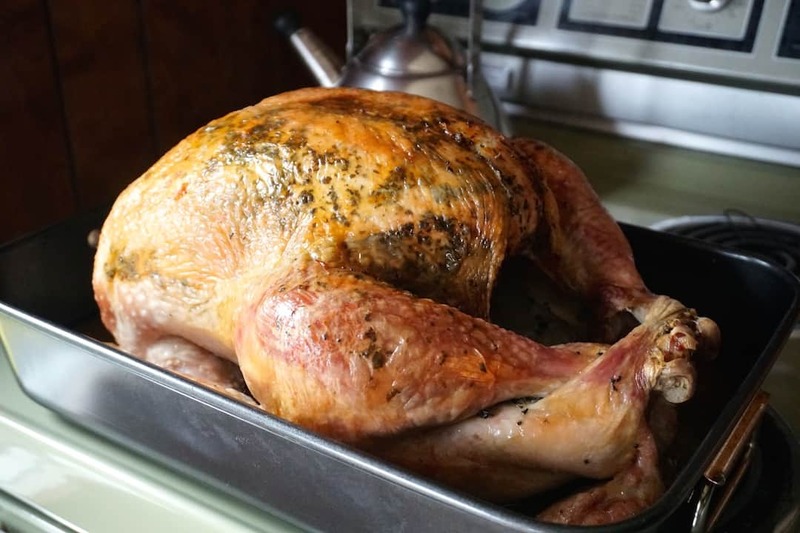 Here’s the deal on preparing a DRY-BRINED TURKEY. If possible, purchase your turkey from, a certified organic farm. Ideally you’re looking for a bird that has been organic-fed and raised free-range. I think it’s also important to use a turkey that has never been frozen – trust me, you will taste the difference. Make sure to purchase your turkey at least four days before you plan on cooking it. This will allow enough time to complete this dry brine recipe properly. Feel free to change up the herbs you use. 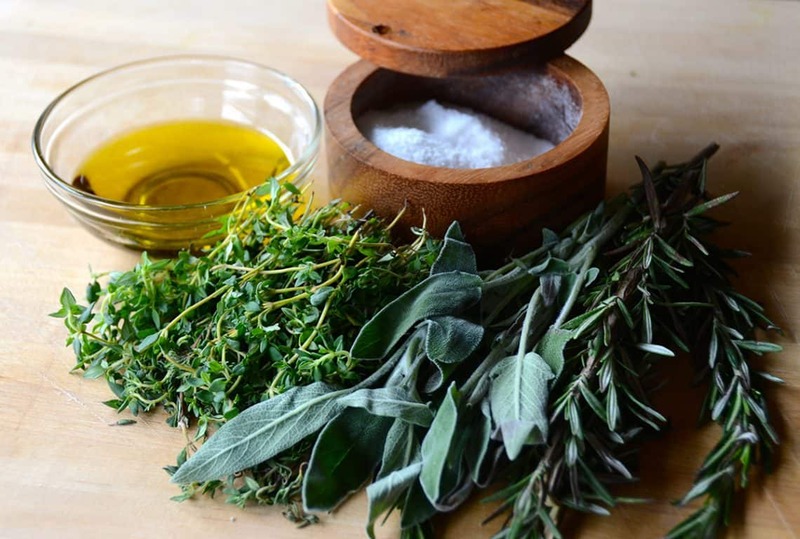 Try different combinations of rosemary, sage, thyme, marjoram, parsley, tarragon and oregano. Create your own winning herb combination. I can’t stress this enough, DO NOT attempt this recipe using anything but kosher salt. I’ll take that even a step further and suggest using a fine-textured kosher salt. I especially like and always use the DIAMOND CRYSTAL BRAND, links below. If using any other brand of kosher salt, use only ¼ cup of salt. 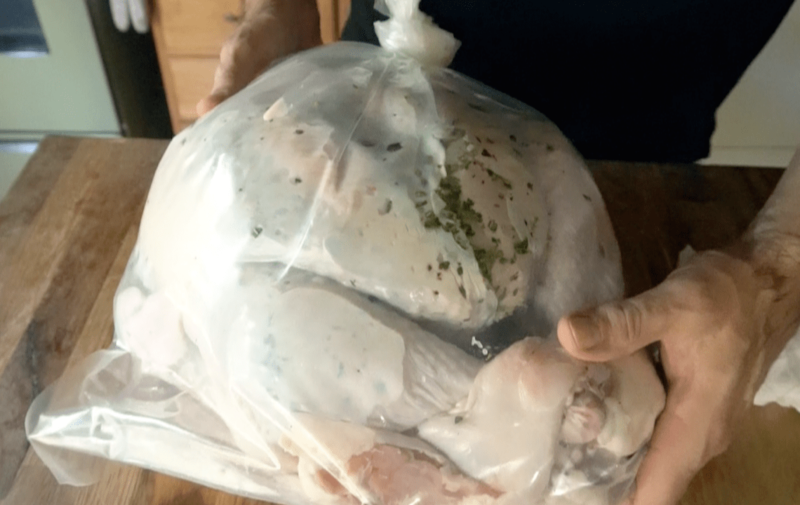 When picking up your turkey, ask your butcher for a brining bag. 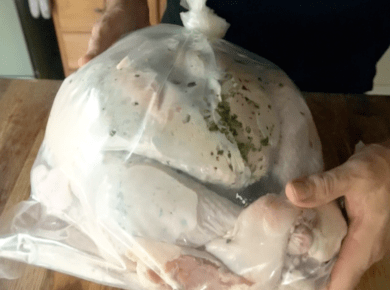 They usually have over-sized plastic bags on hand that work perfectly for the brining process. I especially like the heavy-duty strength, which prevents leaks. Don’t miss the opportunity to baste your turkey with the fat and drippings from your pan every 15 minutes to achieve that glorious golden skin. I also suggest rotating your pan in the oven every 30 minutes. Doing so will ensure every part of your bird is cooked evenly. Promise me you’ll allow your roasted turkey to rest, covered on the counter for 30 minutes before you carve. This is essential, as it allows the juices to settle. There are two additional things I think important to mention, the first being about pan drippings. Because the turkey has been brined, you may find your pan drippings a bit saltier than you normally expect. Keep this in mind when making gravy as you may need to thin out the drippings with broth. The second point is about the overall cooking time. You might be inclined to think “Hey! This cooking time can’t be right!”, yet it is. 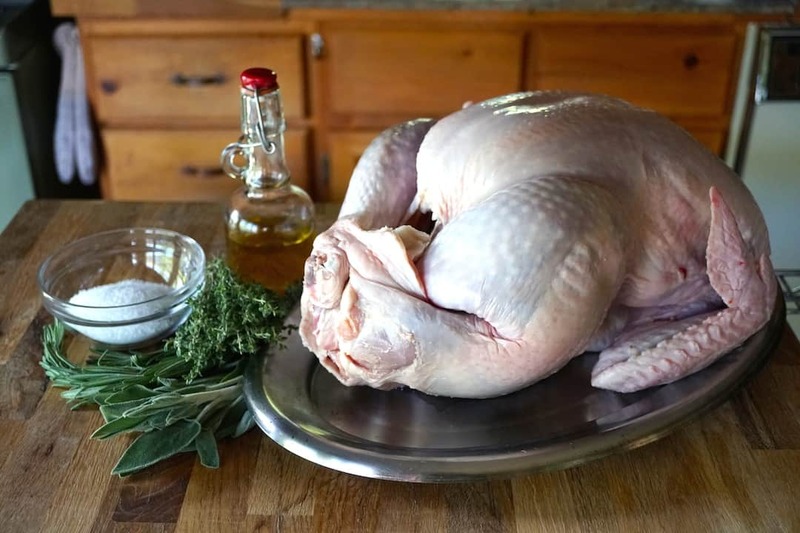 Remember, dry-brining causes the turkey to retain its own natural juices for moisture. Your turkey will roast in less time than you’re used to, but the finished bird will be crispy-skinned and tender with a pure, rich flavour. I promise! Of course, when a turkey turns out as delicious as this, you’ll want to serve it with other fabulous things like our GARLIC MASHED POTATOES, our BEAN CASSEROLE and our LIME GINGER CARROTS. Why stop there? Don’t forget to also try our SAUSAGE DRESSING or our silky smooth POULTRY GRAVY. A COMPLETE HOLIDAY MEAL awaits! 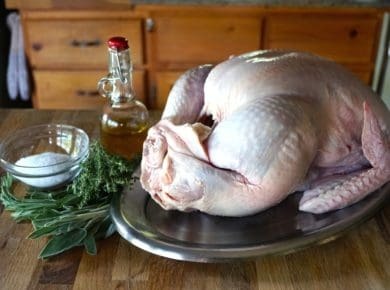 This DRY-BRINED TURKEY RECIPE will have your guests asking for more while leaving you proud as a peacock at your culinary accomplishment! Listening to great music is an important part of every Weekend at the Cottage but Nanny, Lisa and I were so busy yapping, we forgot to turn on the music! I do have a wonderful suggestion for you, something soothing and relaxing while your turkey roasts – Mahler: 10 Symphonies – Bavarian Radio Symphony Orchestra & Rafael Kubelik. Visit iTunes to add this music to your collection.